When you are about to invest in new catering equipment, you need to have confidence in the credentials of the company behind it. Opus 700 is a range of products conceived, developed and manufactured by Lincat, one of the world's leading names in commercial catering equipment. Designed to cope with all the cooking requirements of the busiest professional kitchen, Opus 700 is one of the world's most powerful and versatile choices in its price range. Modular in concept, it offers you unrivalled flexibility when planning the installation of your new equipment. 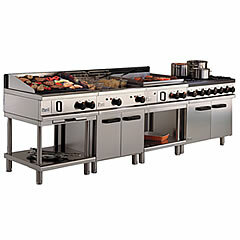 The range features a 700mm front-to-back footprint with extended hob. The result is a cooking area that is amongst the largest in its class with units that require a minimum of floor space. For the compact kitchen, this provides a capacity - and a potential profit - beyond its physical size. The modular design of the range allows units to be jointed together to form complete suites. It also ensures that, as your needs change, Opus 700 changes quickly and easily to accommodate them. Quality is something on which Lincat never compromises. This commitment shines through in every aspect of the development and production of Opus 700. All units are designed utilising the very latest 3D CAD software to ensure that the very highest standards in design, styling and ergonomics are maintained throughout the range. All products are carefully selected for their strength and durability. And every unit is manufactured entirely in Lincat's ISO9001 accredited facility in Lincoln. Opus 700 floor-standing and counter-top models are manufactured in a high sheen polished stainless steel. With the smooth contours and clean pleasing design lines that flow throughout the range, Opus 700 is sleek and stylish in appearance as well as being hygienic and easy to clean. Behind the good looks of Opus 700 is a heavy duty construction and attention to detail that sets new standards in its class. All corners are welded and polished to provide exceptional strength with a clean, seamless line. For added rigidity, 1.2mm stainless steel is used extensively across the range. Sturdy and practical 150mm high legs are fitted to all floor-standing models. Adjustable by 55mm they allow for perfect levelling and quick, easy cleaning. Similarly adjustable purpose built stands for counter-top units are also available. If required, floor-standing models can be fitted with optional castors at no extra cost. Superb ergonomics feature strongly in the development of Opus 700. Control knobs are of a unique design. They are easy to grasp, recessed to avoid damage and are yet easy to se from normal standing height. Chefs can also see clearly if a unit is switched on from across a busy kitchen. In addition, the smooth easy-to clean contours of the control knobs provide no hiding place for dirt and no breeding ground for germs. Opus 700 products are manufactured for gas and electric applications and feature high power efficiency for reduced energy consumption. And every model in the range carries the CE mark: your guarantee that the products are designed and manufactured to meet the very latest European safety standards. Innovative design, superb ergonomics, class leading specification, durable high quality construction, outstanding performance and unrivalled versatility. Whatever criteria you may wish to apply in choosing for your business, OPUS 700 will meet them and a great deal more besides. The full range of products from Lincat OPUS 700 is available from KCM at highly competitive prices. For further details please see our equipment pages under the headings of the specific equipment you require.